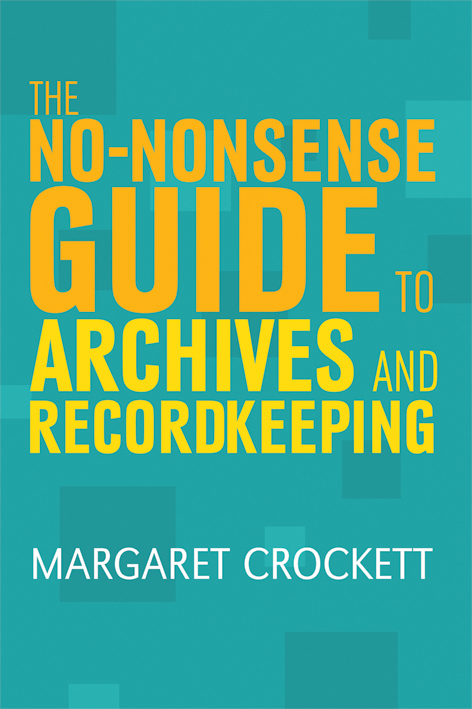 The No-Nonsense Guide to Archives and Recordkeeping is a basic text book on managing records and archives. It explains how some records are really valuable and need to be kept for ever, whilst others can be deleted or destroyed relatively quickly. It will help people to organise their paper and computer records well and to make the decisions that facilitate the removal of things that they don't need. You can dip in and out of the book, using the index or table of contents to focus on the thing you really need to learn. You can also follow the journey of a record, from deciding whether it needs to exist and ensuring it's created as it should be, through deciding whether and when to destroy it, identifying the archive material to be kept permanently, and how to preserve and provide access to it well into the future. “... a nice reference tool for seasoned archivist, a textbook for university students and a comprehensive guide for new archivists” (Emilie Gagnet Leumas, PhD, CA, CRM). It is aimed at people who are in any way responsible for managing records and archives and want to know how to do it properly. It is also a good basic text book for students of archives and records management and can act as a manual for archives and records management operations. This book is definitely one to have on your bookshelf as a first port of call for information and inspiration on all aspects of recordkeeping. For full details see: Facet Publishing’s Website.